At the Star Wars Half Marathon Expo, I was introduced to the latest headphones from the folks at Snuggbuds, the WET! headphones. Like their previous headphones, they are sport headphones that are made for running and biking, but these are also made for water based activity, like swimming. 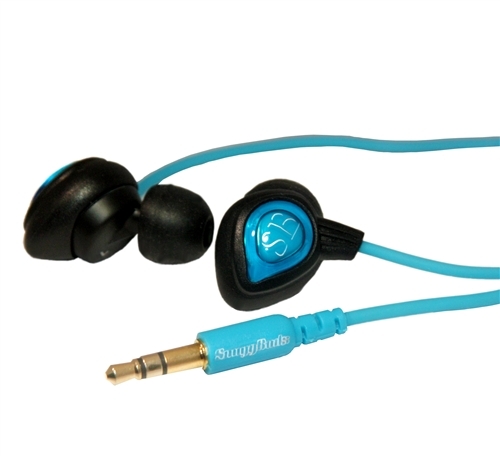 Like the other Snuggbuds headphones, the WET! are supposed to lock in to the user’s ears by pushing and turning the rubber earpiece in the ear. I found the rubber seal to be a little loose, but the teardrop shape of the earphone sat comfortably in the folds of my outer ear, keeping the headphones in place. When running with the headphones in, I could hear my footsteps when walking slow during quiet moments in the recordings I was listening to, but once I started going at a better pace and the music or audiobook got going, it became unnoticeable. Like previous Snuggbuds, the headphones also block out outside sounds very well. Unfortunately, this an be detrimental when running on streets or any situation where hearing is important, but they include a clip and recommend clipping one headphone to the wire in order to keep one ear open. The wire on the Snuggbuds WET! has a smooth plastic feel to them. Snuggbuds had moved to a more fabric wire covering on their previous models, which I tend to like, but since this is meant to be for use in water, that is not feasible. The smooth cables did not tangle too badly for me, even when throwing them in a pocket, and they didn’t cause any additional sounds when I was running with them on. Since I’m only a recreational swimmer and received them in the cold months of the year, I was not able to test them properly for use in water. The best I could do is in the shower and they survived for the few moments I tried it out. The headphones sounded good when I ran with them in. I was able to hear my music and audiobooks clearly, and even the iPhone alerts sounded very clear when they dinged over my music. I found listening to classical music to be clear and sharp. Pianos and strings rang out with each note. When listening to something more akin to Metallica, I found there wasn’t enough bass and it came across as a little tinny. If listening to anything that didn’t have a lot of heavy bass, the music sounded good. The WET! are another set of quality headphones in the Snuggbuds line. Quality sound that stays in the ears on land or by sea to help alleviate the distractions while exercising.